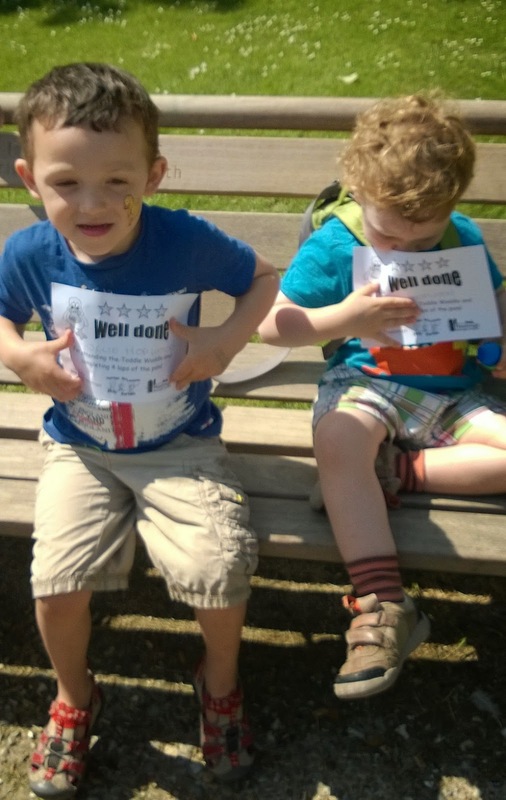 Today we completed the annual Toddle Waddle in our local park. The event is organised and run by a number of organisations with the aim to get little children walking and having fun outside. There is also the option to raise money for your chosen organisation through sponsorship. We walked today for the Play and Learn Service (PALS) who run the play groups we go to. Last year PALS raised enough for a nice tee-pee play tent, and lots of other local nurseries and groups also raised money for new play equipment. It is a lovely day with a real community feel as you bump in to all sorts of people from different groups. This year we even roped in my mother in law who kindly made a fantastic duck outfit which was worn by one of the volunteers stewarding the event. This confused Toby since the last person he had seen wearing the outfit was his Daddy and the volunteer got lots of long hard looks before Toby was convinced it wasn't him. I think we are particularly lucky in the effort local organisations go to in providing opportunities for children in our area, but it is well worth keeping your eyes open to see what is going on in your own neighbourhood. If there isn't much going on, perhaps you might have a great idea to get people together yourself, maybe with a street tea party, or organising a play date in the park for your children and their friends with a picnic and some outdoor toys. If you are lucky like us to have it all organised for you, it's well worth popping along to as many things as you can. By showing your support with your presence you help to ensure the success of events which makes it worth while to the organisers to keep offering these things. Each and every event, from the smallest craft course to the biggest play in the park is a masterpiece of organisation and form filling, so it's up to us to step up and make sure that they're well attended. The toddle waddle today was a great example of a community coming together and I hope that it continues to thrive for many years to come.